Below: Christian Louboutins are perfect as Birthday treats! Birthdays are an excuse to spend $ on frivolous treats for yourself. 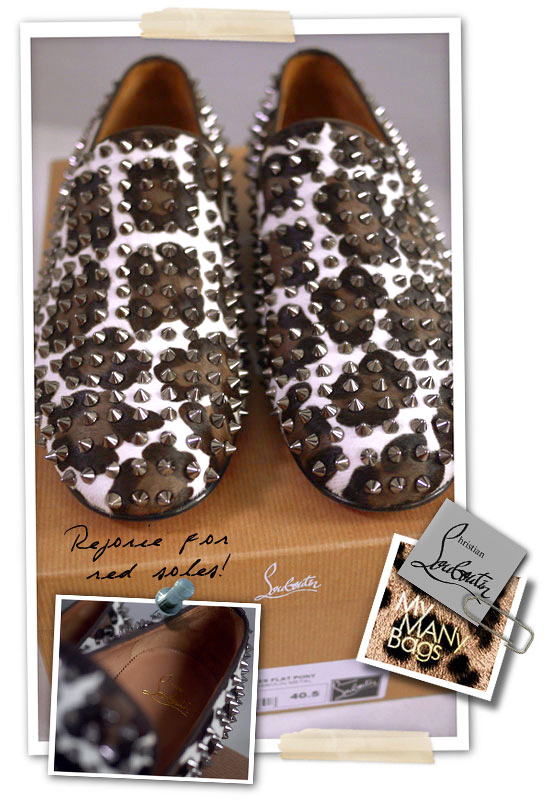 And one of the items on my wishlist are a pair of Christian Louboutin Rollerball Spikes. Getting a pair for my upcoming Birthday is imperative. Since these shoes have gained popularity and more and more people owned a pair now, I was biding my time for a more unique pair to call my own. Thank the shopping gods, my search ended and I found these cool Christian Louboutin Rollerball Spikes in Leopard Haircalf as sold at Brownsfashion. Not your typical yellow brown and black colourways, but in cream, chocolate and black tones. Instead of silver coloured spikes, it is decorated with gunmetal ones. Have not seen these anywhere on other online sites and stores... so it is definitely a rare pair of red soles to covet! All just in time to add to the birthday treats I am getting myself for my upcoming big day (end Oct!). More pics on my facebook fanpage. YEY you! I think everyone deserve to pamper themselves. would like to see them worn as a look!